Port Sarim is the port city of the kingdom of Asgarnia. Port Sarim can be reached quickest from Draynor Village which can be reached by using an Amulet of Glory, from Falador by heading south, or from Rimmington which can be reached by using the House Teleport from the Magic Skill and then heading east from Rimmington. That is, if your house is in Rimmington. Here lies a sole Yew Tree which can be cut with a hatchet (axe) using the Woodcutting Skill providing you have 60 Woodcutting. North of here is a cabbage field, which is near Sarah's Farming Shop and a farming area with two allotment patches, a flower patch, and an herb patch. 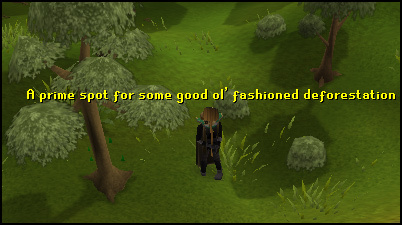 At this location you can find a Spirit Tree Farming Patch whom you can pay Frizzy Skernip the farming gnome to watch for you. 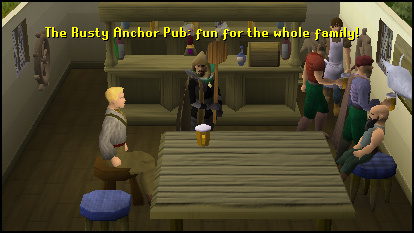 Just west of the Farming Patch you can find the Rusty Anchor Pub, where you will find Longbow Ben, Ahab, and Jack Seagull as well as the local Bartender. You can buy a beer here for 2gp or talk to Longbow Ben, Ahab, or Jack Seagull and hear their stories. Longbow Ben got his name, because when his ship was taken over and his enemy left him on an island with a Longbow and one arrow, Longbow Ben shot his enemy and reclaimed his ship. Jack Seagull is more of an English Teacher than a pirate, and Ahab claims he lost his leg, even though you can see both, and says his peg leg kept getting stuck in floor boards. Redbeard Frank, starts the Pirate's Treasure Quest. 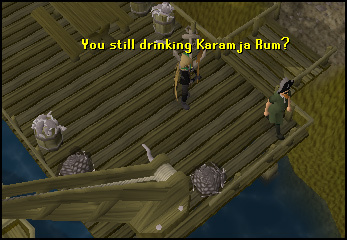 Drunken with Karamja Rum be he. Location 4 is made up of a group of houses, 3 of which are useful shops. Betty's Magic Emporium is marked by the symbol of fire, and sells objects related to Magic. To the east of Betty's Magic Emporium is a house with a sink which makes it convenient to make Attack Potions using the Herblore Skill. Upstairs in the house is a Bronze Bolt respawn. South of that house, is Brian's Battleaxe Bazaar. To the west of Brian's Battleaxe Bazaar is Grum's Gold Exchange, a Jewelry store. This store is also used during the Merlin's Crystal Quest. Note: These are the prices of items at their default stock. Upstairs in this store is also, yet another Bronze Bolt respawn. South of Grum's Gold Exchange is a small double house, containing a Range to cook on, and a level 2 Man. 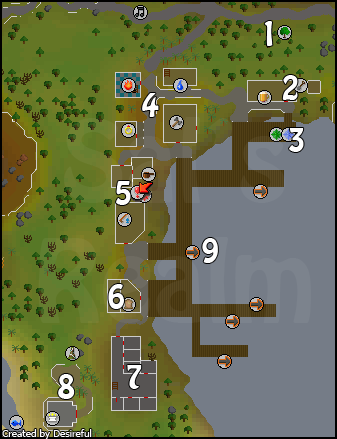 This provides useful with a fishing shop just South of here, as you can easily buy raw fish, cook it, and then head to the Ice Warriors Dungeon on Thurgo's Peninsula for training. As mentioned before, to the south you can find Gerrant's Fishy Business. Note: The are the prices of items at their default stock. All types of raw fish, except Raw Sardine, have a default stock of 0. Fishing Rod, Fly Fishing Rod, Lobster Pot, Sardine, and Crayfish Cage have a default stock of 10. Pot of Flour has a default stock of 500. Harpoon, Fishing Bait and Feather have a default stock of 1,000. In between the house and Gerrant's Fishy Business is the Rat Pits Activity you can play providing you have completed the Rat Catchers Quest. Further south past Gerrant's Fishy Business is Wydin's Food Store. 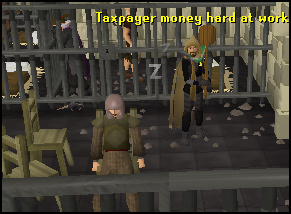 South of Gerrant's Fishy Business is Port Sarim's Jail Cells. An easy way to get here is talk to Shantay at Shantay's Pass located in Al Kharid, and tell him you are an outlaw. Shantay will then place you in a jail, refuse to pay Shantay 5gp twice and you will end up in a cell in Port Sarim's Prison, which you have to picklock to get out. The first cell contains a level 16 thief, the second a level 23 Pirate, third Wormbrain who you either have to pay 10,000gp, or kill and use a telekinetic grab spell on the drop during the Dragon Slayer Quest. The fourth cell contains a level 6 Mugger, and to the south in a cell is a level 33 Black Knight in chains, being watched by a sleeping guard. On the next floor are a lot of level 21 Guards for you to train on, and on the floor above that is a single Guard whom you can talk to, to drive mad. West of the jail, you can find a church. Here you can recharge your Prayer Points, or collect your thoughts in the quiet surroundings of the church. North of the church are some level 2 Goblins and level 3 Rats. West of the church is a fishing spot, with options to Net or Bait. South of the church you can find some willow trees and Thurgo. 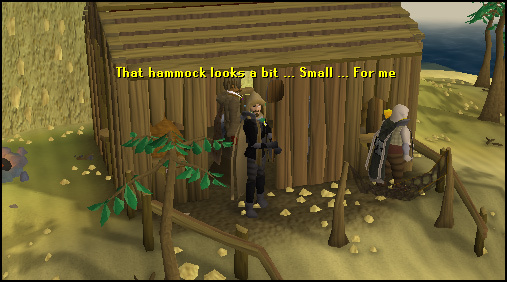 Thurgo is a dwarf who is part of a few quests. 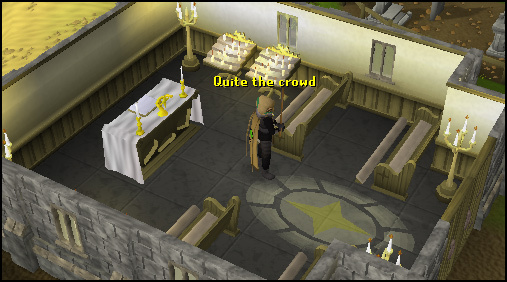 He can also sell players with 99 Smithing a Cape of Achievement. Head north towards Wydin's Food Store and turn east onto the docks. Here, you will see level 2 Seagulls that can be counted as Birds during a Slayer Assignment. Head south on the first dock extension you see to find Trader Stan and two Trader Crewmembers. Note: These are the prices of items at their default stock. Most items start with a default stock of 10. Exceptions to this rule are Pot and Bucket, which start out with a stock of 30, and Pineapple, Orange, Bucket of Sand, Seaweed, Soda Ash, and Rosemary, which shave a default stock of 0. 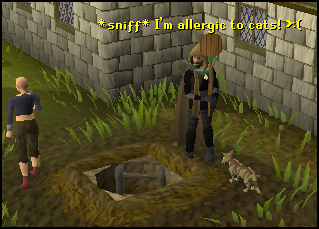 Head north and then east to find a Squire, whom you can ask to bring you to the Void Knights Outpost where you can play the Pest Control Activity. Slightly further to the east on the docks you will notice Klarense, who has apparently stolen your boat if you completed Dragon Slayer. Head west and north until you find Captain Tobias, Seamen Thresnor, and Seaman Lorris. You can pay them 30gp to travel to Musa Point, or if you are wearing a Ring of Charos (a), you can travel for free by charming them. Next head north towards the end of the dock, and then east until you see three Monks of Entrana, who will bring Members to Entrana for free providing they are not carrying any weapons or armor, however they may carry runes.